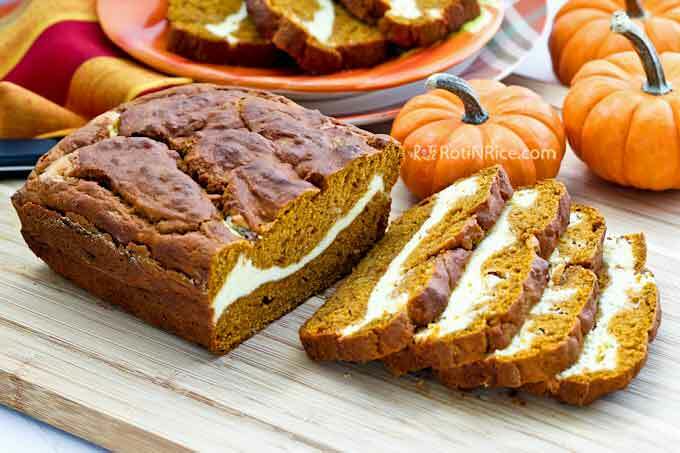 Pumpkin Cream Cheese Swirl Bread – a super moist and delicious bread with a cream cheese filling perfect for fall entertaining or a weekend brunch. 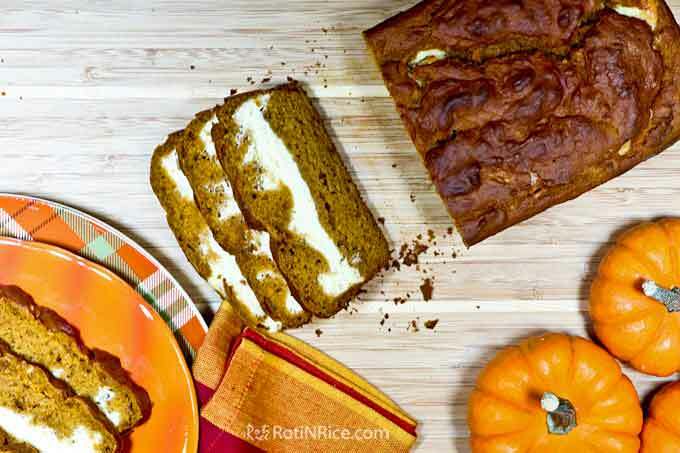 Pumpkin Bread may not always be eaten year round but it sure is a favorite for the holidays. With Thanksgiving just two days away, it is a good time to revisit my jazzed up Spiced Pumpkin Bread with this Pumpkin Cream Cheese Swirl Bread. I have always liked cream cheese frosting and simply added an egg to the frosting to make it into a filling. It was good and it went well with the pumpkin bread. The good thing about pumpkin bread is that it is very easy to prepare. You just put all the wet ingredients into a bowl and beat them until combined. Then stir in the dry ingredients and the batter is ready. It really is almost fail proof! The only thing that might mess up the recipe is if you are living at higher elevation. The higher up you go the lower the atmospheric pressure. Hence, some adjustments are necessary for the bread, cake, or cookies to literally not fall flat. You will need to add or reduce the amount of flour, leavening agent, and baking time so that your baked goods will rise just as beautifully and remain that height as those living at sea level. If you live 3,000 feet above sea level, you will want to make these adjustments. Most cities in Colorado are 5,000 feet above sea level. I remember having to adjust all my recipes the first time we lived here 12 years ago. When we moved to Minnesota, I went back to the “original” measurements. Since moving back here, I was mindful to make the change for this Pumpkin Cream Cheese Swirl Bread. So glad it came out beautifully! As such, you will see the adjustments in my new recipes for high altitude baking in parenthesis or in the notes. Please also take note of the oven temperature and baking time. I made this Pumpkin Cream Cheese Swirl Bread for a Women’s Bible Study group and it was very well received. It is also a good one to serve for a brunch or a tea party. I hope you will give it a try. Staub Serving Bowl, White, 3.4 qt. 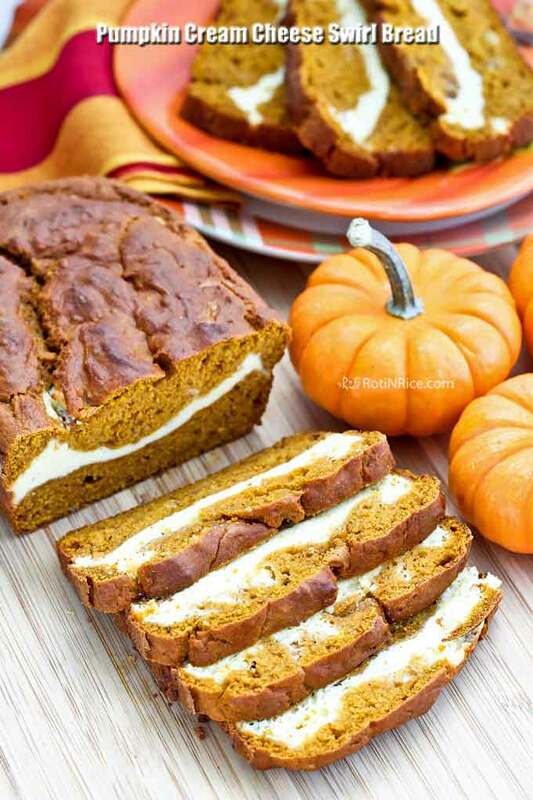 Pumpkin Cream Cheese Swirl Bread - a super moist and delicious bread with a cream cheese filling perfect for fall entertaining or a weekend brunch. Grease and flour a 9x5x3 inch loaf pan. Preheat oven to 350˚F (180°C). For high altitude preheat oven to 375˚F (190˚C). In a medium size mixing bowl combine all-purpose flour, baking powder, baking soda, salt, ground cinnamon, ground nutmeg, and ground cloves. In a small bowl, beat cream cheese, sugar, and egg until smooth and combined. This should take about 2 minutes. Set aside. In a large bowl, beat egg, oil, brown sugar, pumpkin puree, and milk until combined. Add dry ingredients to pumpkin mixture. Stir until well combined. Pour half batter into prepared pan. Then pour cream cheese mixture over pumpkin batter followed by the remaining batter over the cream cheese mixture. Swirl with a butter knife. Then gently tap the pan on the counter several times. Bake in preheated oven for 1 hour or until a wooden toothpick inserted near the center comes out clean. For high altitude, bake for 50 minutes. 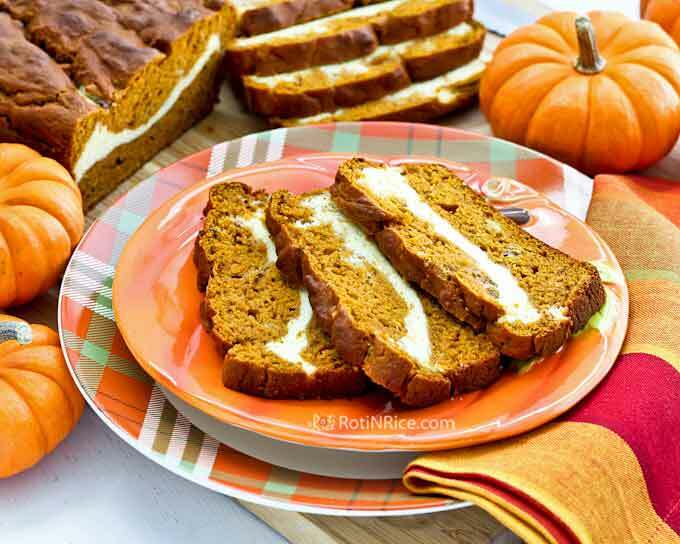 Cool in pan for 10 minutes, remove and allow pumpkin bread to cool completely on a wire rack before slicing. VERY HAPPY AND BLESSED THANKSGIVING!